As the last barbell settles at CrossFit Fifty, an open-air garage gym in Honolulu, Hawaii, the athletes lie on the sun-stricken pavement, heaving as they stare up into the electric-blue sky. At CrossFit Below Zero/I.C.E. NYC, tucked inside a luxury condominium in Manhattan, an athlete rests against a marble column, chalk dust trickling from the brass-coated pull-up bar above. Once they can breathe again, CrossFit Fifty athletes report to the whiteboard to give their times, scrawling their scores next to a list of mantras—“don’t panic” among them. CrossFit Below Zero athletes sign on to Wodify, broadcasting their efforts on bright flatscreens mounted in a neat line on the wall. One group leaves sweaty and sun-kissed, hiking the 400 meters to their cars down the block. 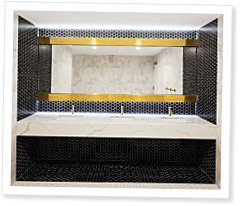 The other crew stops for a shower in a gleaming spa-like bathroom where high-end shampoos, hair spray and body towels big enough to camp under return the New Yorkers to normal before they step back into the Manhattan streets. Both leave a little fitter than they were before.